I help busy women who are tired of surviving to live out their God-given potential through the power of whole food nutrition. If you're tired of dieting and following the nutrition "rules" that leaves you feeling tired, frustrated, and hungry, then you are in the right place! Utilizing a functional nutrition approach, I take a deeper look at your biochemical make up, genetics, environment, lifestyle, and health goals to tailor a nutrition plan just for you. I believe food is medicine. Our work together isn't just aimed at addressing your physical health, but we also address your relationship with food. I will work with you to bust through the food pyramid and develop a personalized plan that allows you to fully engage with life! As a Registered Dietitian and Nutritional Therapy Practitioner, I take a different approach to food and diet. We work together to take the hassle out of eating by focusing on the nourishment food provides. This means no more dieting. No more restriction. No calorie counting. No calculating grams. Simply eat whole, nourishing foods in the right balance for your body. Personalized nutrition for women, children, and families. "You will never know the role you played in my life these past months - suffice it to say you were a huge part of my sanity in learning food wasn't my enemy... God gave you to me when He knew I'd need it... thank you just isn't enough.."
"I have had stomach issues for over 4 years. With Amy's help and guidance through food and supplements, my stomach is healing itself. Thanks for all your expertise." "Since my daughter was an infant, she had experienced severe diaper rash and eczema. When she was three, I reached out to Amy, and as we began our journey to better health, Amy was there every step of the way. Within two weeks of following her protocol, all of my daughter's eczema had cleared. My daughter is free from eczema and without help from Amy, I don't think we would have these results." "Amy worked with me to help me understand the root cause of my slow metabolism, dizziness, and lack of energy. It made me so much more aware of how everything gut-brain-health are all connected in my body as she educated me in a make-sense way that did not overwhelm. She has the most calming nature and her bedside manner is so warm, she puts you at ease." "I came to Amy looking to have a better pregnancy and birth experience with my second baby than I did with the first, and that is exactly what we achieved together. I had no signs of preeclampsia this time, my gestational diabetes was much more manageable, and though I had to be induced again, I was able to achieve the unmedicated birth that eluded me the first time. Amy's guidance not only helped me achieve a healthier pregnancy and better birth, but I was able to overcome difficulties afterward with building my milk supply when we discovered that my son was not transferring milk efficiently. By far, the best investment I made during my second pregnancy! I recommend Amy to anyone looking to improve their diet and health!" 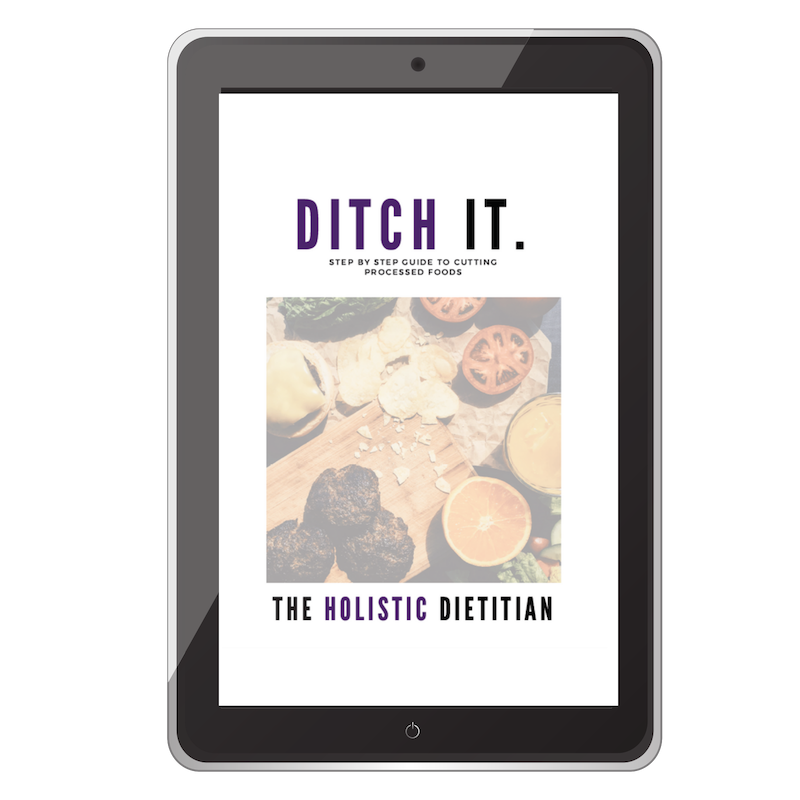 Join my newsletter and receive Ditch It, a step by step guide to ditching the processed foods from your life!